We drove into Lake Louise at 11am on September 22nd and the last parking spot for miles around was long gone. The road to Moraine Lake would soon be closed with cars queued to get up the road much like concert-goers outside a bar. This could only mean one thing; It was the third weekend in September and Larch Madness had struck once again! 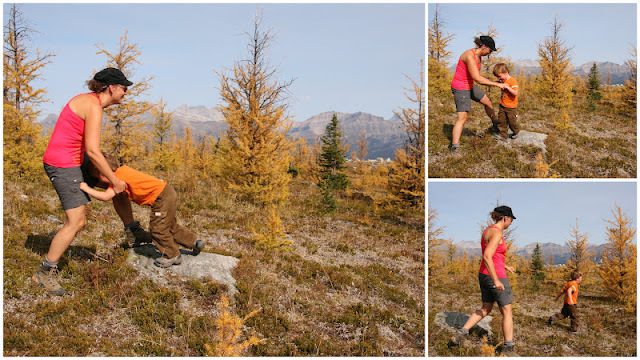 While not a disease, it certainly does hit the city of Calgary and surrounding towns in the Bow Valley like a fever as hikers and non-hikers alike pull out hiking boots for the annual Larch Valley Pilgrimage. Now surely the author of a local hiking blog would know better than to get caught up in the craziness around Lake Louise and would know of more secret places to hike, right? Definitely. I do. But even when you know better, there's a reason everybody flocks to Lake Louise. 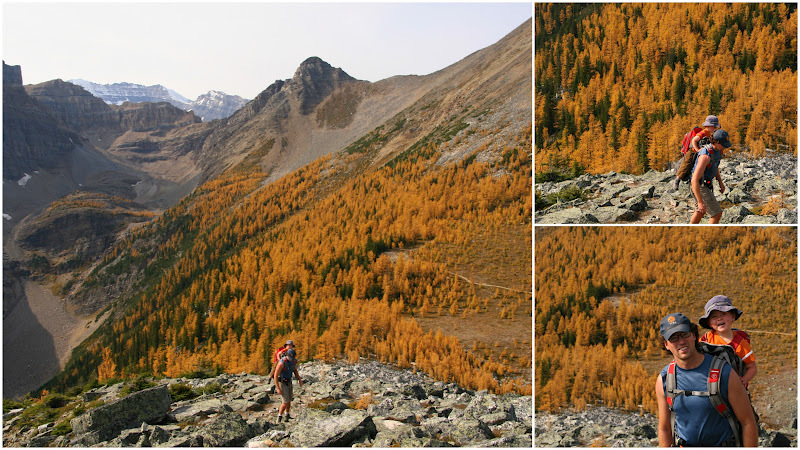 The hikes there provide some of the easiest access to the golden larch trees that only grow between 1800-2400 m. I know lots of awesome places to see larch trees if I want to backpack overnight, leave my child behind and do a grueling 25km marathon hike, or even pay to board a bus up to Sunshine Village or Lake O'Hara. Lake Louise however allows for free easy hiking with short distances and well maintained trails. Families for the most part will all be found within its vicinity. We weren't crazy enough though to try to get into Larch Valley on the weekend. We saved that until Monday for the second year in a row. And while it was still busy, we at least got parking and enjoyed a few peaceful moments on the trail. (not many, but a few) Saturday we decided to head up to Saddleback Pass to view the amazing display of golden splendour from the top of Saddleback Peak. I find it interesting that if you ask Parks Canada staff for suggestions on getting away from the crowds, they will rarely suggest this hike. Yes, it's accessed from Lake Louise but you don't have to brave the Moraine Lake Road or fight with those headed for Larch Valley. You start right from the upper parking lot at Lake Louise. The parking lot is still crazy (we had to park on the side of the road) but once you get on to the trail for Saddleback Pass you'll lose about 80% of the crowds heading for the lake itself. Most families parking here would likely head for the Lake Agnes Tea House (easier, less height gain and much shorter) but with a bit of perseverance (and a child carrier for younger ones), Saddleback Pass is attainable. As a bonus, I actually think the views from the pass are prettier than those from Larch Valley. There are certainly more larch trees anyway - which is the reason you're out here after all. Now, the main reason I wanted to share this story with you - the photos! Please enjoy a collection of some of the best shots we got hiking to Saddleback Pass. It's a little late now to see the larch trees at their peak but mark it on your calendar - I WILL get out with my family next September to see the larches turn colour. Third week in September. Every year like clockwork - makes it easy to put a recurrent reminder on your calendar. Somebody got tired on the way up. Thank God for child carriers and strong Daddies. Who needs friends when you have an awesome Mommy to play with! For more information on fall hiking in Lake Louise, go to the Parks Canada Website. OK, I am officially jealous of living somewhere with actual fall colors. Beautiful photos! Thanks. We do love our larch trees. Breathtaking stuff> good to see kids on the trail.